I’ve been on a role with old films – City Girl, Boudu Saved From Drowning, French Cancan, and now Sunrise. 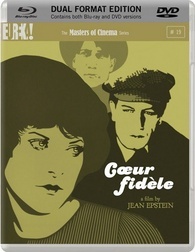 I was hoping 5th one would be a charm with COEUR FIDELE but unfortunately I wasn’t blown away with this Jean Epstein film. All I can say is that this film is one of the most creative edited and directed old films I’ve ever seen – I give credit to that, as well as the beautiful scenery of good ol’ France. But the story is really not that interesting. This movie is a rather depressive melodrama with a very bland storyline. The whole movie focuses on a dreary woman with amazing eyes, caught between an a-hole who likes her and a nice guy who likes her. The whole movie is just her moping around town. It’s too bad the story was not stronger because it would be so much more rewatchable. As usual, Eureka did a perfect job of remastering. The video quality is so crisp, clear, and fresh, it’s like watching the movie in 1923. The audio is perfectly mixed too – with a very interesting dark soundtrack. The only extras are an interesting 44-page booklet and photos. If you want to see an old film with very creative and original direction/editing, then check out this film.